And you certainly don't want to stand beneath the sky in such a situation trying to unlock your car's frozen door. It's better to be acquainted with the knowledge to handle such a situation. That's why we bring for you all the tips if you have a frozen car door ever. All the tips discussed will require one or tools but you don't need to purchase anything too expensive. General utility items and tools will suffice. So, let's begin with all the tips… Remember you can use any one of the tips to unlock your car. It depends on which tool or item you have readily available with you…Just use it according to the instructions here and you'll have an unlocked door with a little effort. We start with a pretty simple way to unlock your frozen door. Yeah… you read it right. You need to heat your car's key. You don't have to fry it or microwave it or even blanch it…Just use a small lighter to heat the key and then use it to unlock the frozen door. With some heat and a bit of force on the key, you should have your door open. However, the success rate of this method is not 100%. It does work at times and sometimes doesn't. Nonetheless, you can always try your luck especially when you don't have any other alternative available. This method would be apt when the lock has frozen and not the key. You have to be a little careful while using this method. As the key is made up of metal, it can get too hot to touch when heated. Make sure you cover your hands with those gloves lying on your dashboard. There is another important thing to be taken care of here. Heat the key only when it's 100% metal and doesn't contain any electronic chip. Many times, ice forms a thick crust on the door lock handle and even the seal which freezes the door. This makes it almost impossible to open the door unless the ice is removed. A simple way to solve this problem is chipping the ice away. You can use an ice-scraper for it. If you don't have an ice-scraper available with you, you can use any stiff plastic object available with you such as a spatula. You can also use your credit card. However, be careful that you don't use any metal object as it can scratch the glass and the paint. This one is a pretty cool hack for frozen locks or even door seals. You’ll need just a blow dryer for this method. You may need a long-cord extension to connect the blow dry with power in your parking area. Another option is using a battery-operated blow dryer. However, this method could be hazardous and you need to be cautious while using this method. Remember to move the blow dryer constantly back and forth across the door seal. Too much heat by placing the blow dryer in one spot could break the glass, especially if there are existing cracks or chips. This is another cool hack just like the blow dryer method. However, you’ll need a remote car starter for this method. 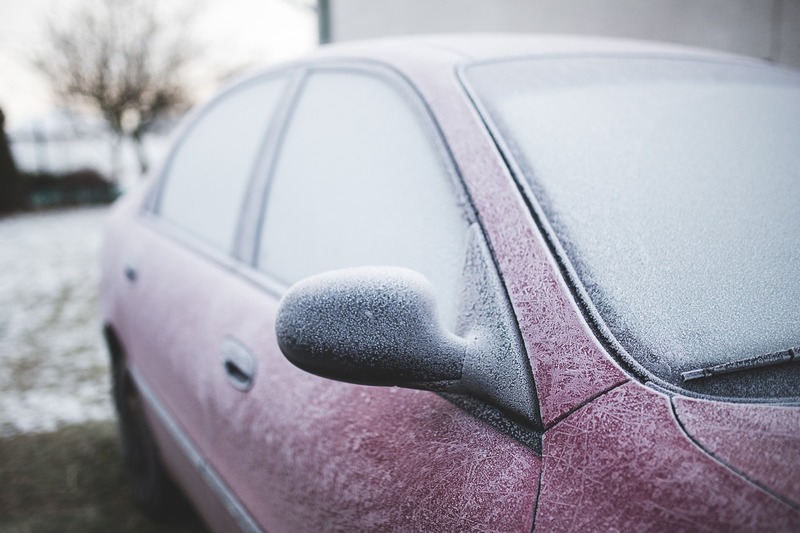 If you have it, then use it to start your car remotely and let the heat thaw the car door from the inside. This can take about 10-15 minutes but your car will be warmed up from inside and you’ll have the door unlocked in almost no time. You can use lukewarm water to defrost the lock. You can use a large cup or container or even a handy bucket for it. Pour the water around the seal to thaw the ice. However, you may need to repeat this process several times to effectively thaw the ice. Remember not to use hot water as the temperature difference may break the glass. Once the door is opened, dry off the seal with a dry towel to prevent refreezing. This one is also a pretty quick and cool hack like the ones described above. You just need to push on the car door by leaning over it. Apply as much force as you can and you could also get someone for help. The pressure will help to break the ice around the door’s seal thus helping you open the door. This one is one of the most common advice but also the most workable one. There are commercial de-icers available in the market which makes the unlocking job easy. You just have to spray the de-icer over the lock and wait for a while. You can easily find it in auto shops or hardware shops. It not only helps to thaw the ice but also prevents further freezing because it acts like a coat of lubricant over the lock which helps prevent further moisture from collecting on it. If you don’t have a commercial de-icer, you can also use rubbing alcohol but it should have at least 60% alcohol. WD-40 and white vinegar are other last options. This is another easy hack which doesn’t require any object or supplies apart from leftover cardboard roll from the toilet paper. Those were 8 ways to fix a frozen door in this cold climate. Either of them should work for you… The decision to choose any one of them will depend on what supplies you have available with you and also the waiting time. Either way, any of them should work for you with a little patience and effort.